The way I see it, there are three levels to eating at Tom + Chee. I know this because… I attended a blogger taste test this week at the West Maple Street Tom + Chee and compared amounts of grilled cheese sandwiches and grilled glazed donuts that would make linebackers blush. 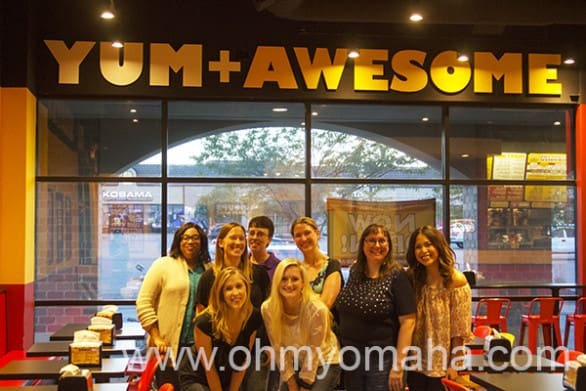 Omaha bloggers love Tom + Chee. 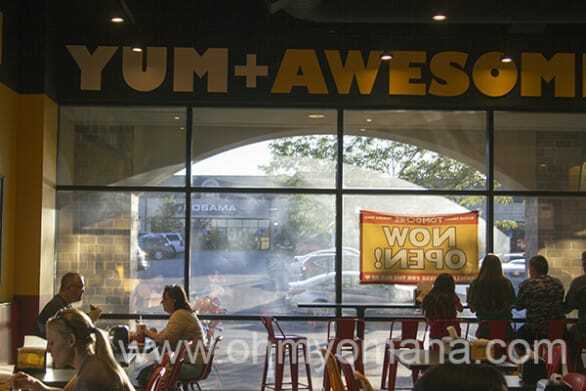 Yum + Awesome, indeed. 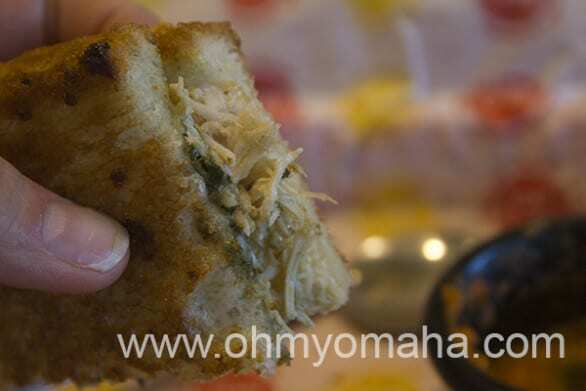 Here’s my takeaway: You have three choices when dining at Tom + Chee (none of them are wrong). This is my favorite. Accept that this is a single meal in the grand scheme of your more colorful and plant-based diet and go to town. Get that grilled cheese donut, you know you’re curious. My recommendations: The winners during the taste test were standouts. The turkey pesto – made with sunflower seeds instead of walnuts – great and the night I had it, it was served with smoked Gouda instead of mozzarella. Another good choice is Tom + Chee’s most popular sandwich, the Flying Pig (turkey, bacon, smoked Gouda, and crisp pickles). The Turkey Pesto Chee is made with turkey, made-from-scratch pesto (sunflower seeds) and mozzarella…or smoked Gouda as was the case the night I was there. It tastes better than it looks. And heck, order a little dipper: For a buck, you can get a small soup to dip your grilled cheese in. Go big: You can add extras to sandwiches. I tried one sandwich with potato chips in it – remember adding those to the bologna sandwich your mom packed in your school lunch? Try it with melted cheese. Really want to fall off the bandwagon – like over a cliff? Add mac n cheese. Top it off with dessert: Admit it, you’re there because you’re curious about these so-called grilled cheese donuts. Can they be that good? Save room for dessert at Tom + Chee. I recommend the Strawberry Lemonade Grilled Donut. My favorite of the night was the strawberry lemonade. You take a glazed donut, split it into two, add fresh strawberries and candied lemons and seal those in with lemon mascarpone and mozzarella. Grill it and serve. Messy? Yes. You might have noticed in the above pictures an overall color scheme of yellow and beige. So, the second level of Tom + Chee enjoyment adds some color to your diet in the form of vegetables. My recommendations: Create a build-your-own sandwich with whatever sounds good to you (bacon) and make your mom proud by adding any of the unlimited vegetable toppings. Then, order a salad and pat yourself on the back. The salad still has a ton of cheese on it, so you’re not going to starve. I tried two – Green Goat and Caprese Salad. Both were winners. Can you guess what kind of cheese is in The Green Goat salad? Not a salad person? The “Tom” in Tom + Cheese is for tomato soup. They have four varieties. Try the Creamy Tomato Basil, it’s not the healthiest option of the soups, it’s just tastes wonderful. I was embarrassed and hated myself a little with how much I ate at Tom + Chee. If you fear going off the deep end with that much butter and cheese, I hear you. My recommendations: Start off with a chunky tomato soup, it tastes how I wish my garden tomato soup would taste. Fresh with no additives, it’s the way soup ought to be, and it’s just tomato, basil and garlic (beware of creamy varieties if you’re trying to cut down on calories). You could order a salad, and be done with it. Or go the grilled cheese route, trying a build-your-own sandwich with just one cheese (instead of the allowed two) and go for a less processed meat if any. Stack on those veggies. You’re going to be hard-pressed finding calories listed anywhere, so use your judgement with extras – maybe the mustard instead of oil-based stuff. There is a sandwich called the Hippie + Chee, with good stuff like cucumber, greens and tomatoes in it. The hummus in it didn’t do a thing for me, though. Best time to go is Tuesday nights: Kids eat for .99 cents. Kids meals, called Lil Grillas, comes with a small grilled cheese; small soup, fruit or chips; and a drink. The dinner crowd on a Monday night at Tom + Chee in Omaha. Cost: Per the company’s website, most Sandwiches start at $3.95 and up. Most salads start at $3.45 for a small and up. Soup usually start at $3 and up. Donuts start at $3.95 and up. Edited August 3, 2015: Congrats to Cheryl E.! Your entry was drawn to win the first giveaway. Oh My! Omaha subscribers are automatically entered in the second giveaway, which will be drawn Friday, August 7. To subscribe for free, go here. Want to try Tom + Chee for yourself? They’re still pretty new here, so I bet some of you have yet to visit. The local Tom + Chee gave me some vouchers to let some of my readers try their cheesy good stuff! Two people will win vouchers worth for two fancy grilled cheese sandwiches and one grilled glazed donut – each worth about $25 of food! This is for the Omaha location. 1. First way to win: Visit the website to browse the menu, then leave me a comment telling me which sandwich you want to try. Earn a bonus entry by following me on Instagram; leave a comment with your Instagram handle. Giveaway ends at 11:59 p.m. on Sunday, Aug. 2. I’ll draw a winner’s name randomly (via random.org) on Monday, Aug. 3, and the winner will have 48 hours to reply to my email. 2. Second way to win: One Oh My! Omaha e-newsletter subscriber will be randomly drawn to win the second set of vouchers. I’ll draw a winner’s name on Friday, Aug. 7. Same deal goes, the winner will have 48 hours to reply to my email. Not a subscriber? It’s FREE! Subscribe here. 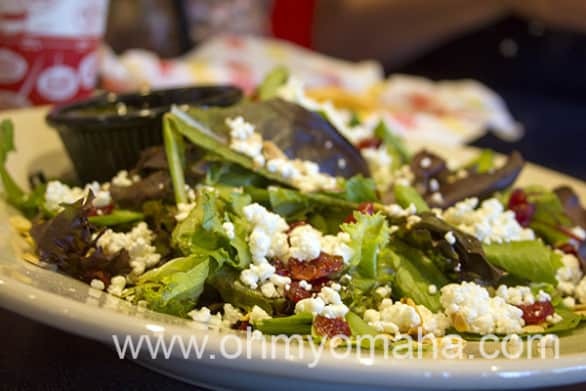 I only send out one e-newsletter each week chock full of things to do in Omaha. Never miss a giveaway – subscribe! More giveaways to feed your Tom + Chee habit! Disclaimer: I was provided complimentary samples of a ton of Tom + Chee sandwiches, salads and soups in order to share my opinion on them here, as well as food vouchers. Vouchers for the giveaway were provided by Tom + Chee as well. Dying to try the BBQ & Bacon chee and the Blueberry Blue donut chee! The King or Smore…gotta go with the donut ones, right?! It’s so tough to pick! I think for my first visit, I’d have to go with the classic grilled cheese donut sandwich and ad a Little Dipper. The Hippee Chee and Bacon and bleu look yummy! I’d like to try Pesto Turkey. Nom Nom! Oh My! Omaha e-newsletter subscriber. I’d love to try the desserts, especially the bananarama! I want to try a BLUEBERRY BLUE on the dessert menu! Ooh, crunchy garlic chicken is calling my name! YUM! I’d also like to try the Hot + Spicy. Grilled mac + cheese & smore! I follow you on Instagram. Atormond also, I get your newsletter. So many great choices. I’ll have to vote for the Flying Pig. Grilled mac and cheese and Mint Summer’s Night! The blt&chee and classic tomato soup. I want to try allllll the grilled cheese donuts! I would love to try any of the food items, but I think the donuts look delicious! My husband is a donut lover, so this would be a fun little date one evening! The smores donut looks great! I want to try the grilled Mac and cheese donut! I would love to try the Hippie Chee sandwich. Sounds yummy! The Tom + Chee looks delicious but so does everything! It would be so hard to decide! I follow you on Instragram – jmschurman. I want to try the more…perfect for summer in Omaha! 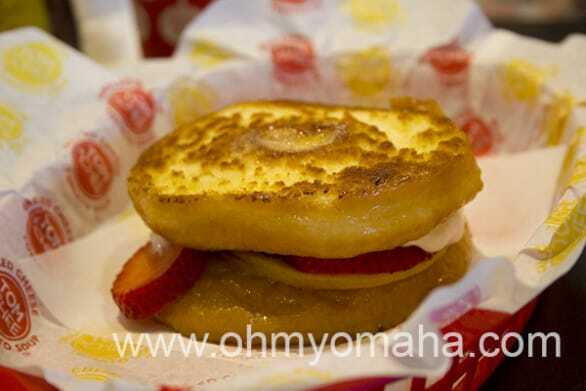 I must have the strawberry lemonade grilled cheese donut! Oh my goodness, it looks so good! The Turkey Pesto Chee sounds GREAT! I would love to try the BBQ & Bacon…cuz what is better than Bacon and Cheese and BBQ??? And to finish with a Smore donut…cuz again…what is better than chocolate and marshmallow?? I want to try the strawberry lemonade donut. I’d like to try the Blueberry Blue donut. I would love to try the veggie grilled cheese! How about the turkey pesto. Or some soup! I want to try them all! But I think I would start with the Flying Pig. That turkey pesto looks amazing!